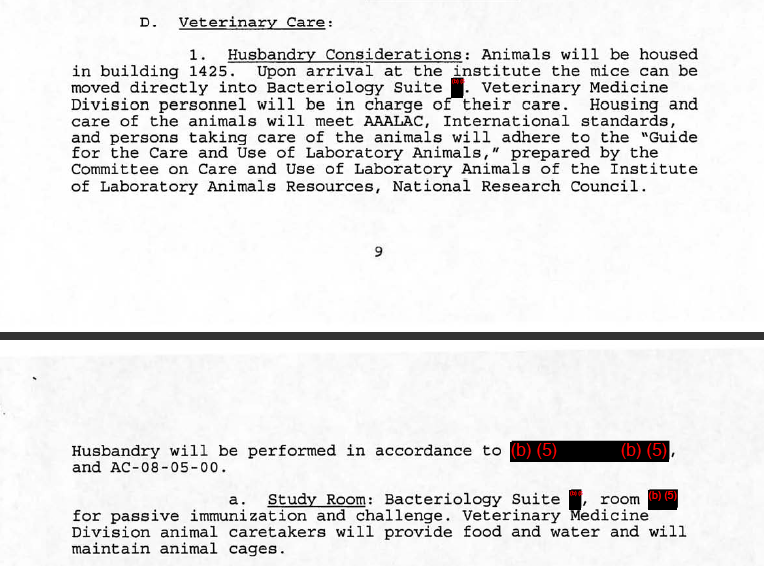 * Like the rabbits shipped to USAMRIID Building 1425 the week of September 24th and acclimated to biolevel 3 for one week before being challenged, the mice similarly were housed in building 1425, not building 1412 « CASE CLOSED … what really happened in the 2001 anthrax attacks? This entry was posted on December 26, 2011 at 7:59 am	and is filed under Uncategorized. Tagged: *** 2001 anthrax attacks, *** Amerithrax, *** Dr. Bruce Ivins, *** FBI anthrax investigation, guinea pigs & mice, ivins lab work in fall 2001, USAMRIID Building 1425. You can follow any responses to this entry through the RSS 2.0 feed. You can skip to the end and leave a response. Pinging is currently not allowed. The room redacted above is B305, near Dr. Worsham’s office in the B3 suite. Any suggestion that the studies in September were done in 1412 rather than 1425 has no basis in the documents produced by USAMRIID under FOIA. FOIA is meant to let the people trust and control the government. The People and the States together are sovereign. The federal government itself apart from the People and States does not have sovereignty over the People and States. The FOIA reflects that the People and States together have all the sovereignty and the federal government has none. This means the People and the States have the right to key information possessed by the federal government. It doesn’t belong to an autonomous federal government that self creates its own sovereignty out of itself over the People and States. The supreme lawmaking authority under the Constitution is a Constitutional Convention of the States. Thus sovereignty does not lie under any theory of sovereignty in the US in the executive departments of the government. FOIA is for the true sovereigns in the US system, the States and People to get the information that they own, and which the executive departments of government do not own. States also have FOIA statutes. Michigan, Louisiana, Maryland, Virginia, Florida. They have been an overlooked resource in assessing Amerithrax. We are entitled to the room numbers of key events to be unredacted since they are critical to the current debate. This is precisely because they dovetail to the records of Ivins in and out times in Suite B3. Your point about the room numbers is an excellent one and I copied you this morning when I raised the point in an email to the wonderful USAMRIID FOIA officer, who will be back after the New Year. You also raise an excellent point on the names of people. The FOIA officer, in a separate contest, advised me that would not be able to give unredacted names and room numbers relating to access. See (b)(6). She suggested, however, that she could likely provide a roster of names with access to B3, Building 1425, during a specified period. On my own initiative, I told her that I will never appeal any decision she makes and will always defer to her judgment and expertise (though I try to arm her where appropriate with the applicable precedent). And she could confirm that I can be quite a nag. For others an administrative appeal (upon a denial of a request they make) is a simple matter — it typically just involves an email to a different person. Sometimes JP would be able to grant greater access upon further consideration of the precedent and factual particulars. And, of course, Public Citizen and New York Times are highly expert at pressing through litigation the right to documents. Most recently, Scott Shane has sued for the memo explaining the justification for killing Anwar Awlaki by a drone. NYT aims to make it the subject of discussion (and is not interested in operational details). But as to USAMRIID, I have chosen to instead to be forever grateful for small favors. The same FOIA officer has been doing her job diligently now all year and provided quite extraordinary service in providing documents then uploaded to this blog. Other standouts have been University of Montana, DIA and CDC. Among the worst have been University of Michigan and the FBI. The USAMRC FOIA officer stands ready to do the same excellent work under FOIA for any other requestors. The key is to be able to identify precisely it is what you are looking for so that it can be tasked to the right person. USAMRIID has shown itself to be in full and conscientious compliance with FOIA — and to have established world records in response time. In this context, controlling precedent (see annotations online) is what you should cite in support of production — not legislative history. This is one of the emails where room numbers should be unredacted. FOIA means releasing the key information, not the number or name that makes all the difference is covered over. The name of the statute is part of the statute. Freedom of Information Act, not Freedom of Ignorance Act. The prosecutors and investigators agree that the animals were in Bacteriology Suite B3 in Building 1425, which was the biolevel 3 suite. See AUSA Lieber and investigator Montooth interview. They apparently had just had not obtained the protocols describing the details of the experiments and had not mastered the emails. B5, which is where the lyophilizer was, was biolevel 2. The DOJ withheld key lab notebooks and emails and other contemporaneous documents while spinning their narrative. I’ll continue uploading FOIA documents produced after the New Year.